I finally got batteries in my camera to take this little guy’s picture. I’ll admit that I don’t have much experience crocheting in the round….if you need a scarf, or squares, I’m you girl. But for some reason, the times that I’ve done rounds, my projects end up leaning as if they are taller on one side than on the other. Which is why my poor little chicken looks kinda crooked and lumpy. But that’s okay, I still love him! Has anyone else ever had the problem I have, and if so, what am I doing wrong? 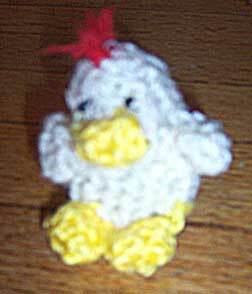 Hi Lisa, your chicken may be a little wonky but it gives him personality, so I wouldn’t worry too much about it! I’m wondering if you’ve been crocheting in a spiral, or joining at the end of each round? If you’re crocheting in a continuous spiral, I can’t imagine why your work would get lopsided… If you’re joining at the end of each round, there could be something about the way that you’re joining that’s giving your work a bit of extra height at the join. I think you have an adorable chicken!! How big is your little guy he looks pretty tiny. I’m not sure, I think I joined each row w/ a slip stitch, but now that I re-read it, it kind of sounds like only the first row should have one… would that explain my problem? Lisa, no you did the right thing by joining at the end of each row. I suspect that you may have inadvertently crocheted into that slip stitch (or the ch 1) when you got back round to it again, thus adding one stitch at that point in each round, which would explain the wonkiness. If you put a stitch marker (which could just be a bobby pin or piece of contrasting yarn if you don’t have a real one) into the first stitch of each round (i.e. the first sc, NOT the ch 1 after joining the previous round), you’ll know when you get to the end of the round to join to the stitch with the marker in it. Does that make any sense?! He’s cute and what personality! I think he is adorable. Good job! I bet you’re right, Planetjune, I’ll make sure to use stitch markers next time! 🙂 Thanks for the compliments everyone. I love your little chicken, especially the tuft of red hair.